Apparently I'm over my anti-dpn mood that I mentioned the other day. 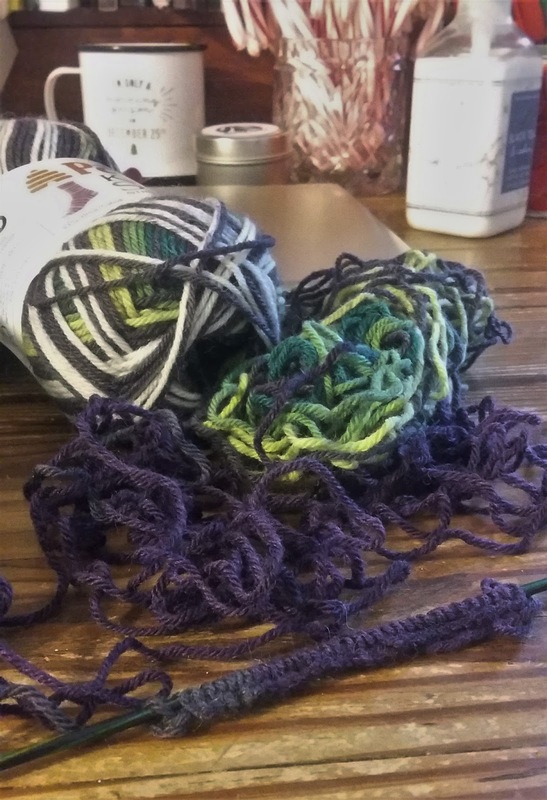 As soon as I pressed "Publish" on that post, I picked up the dpns and cast on for a pair of fingerless gloves and by the time you read this, they should be finished. 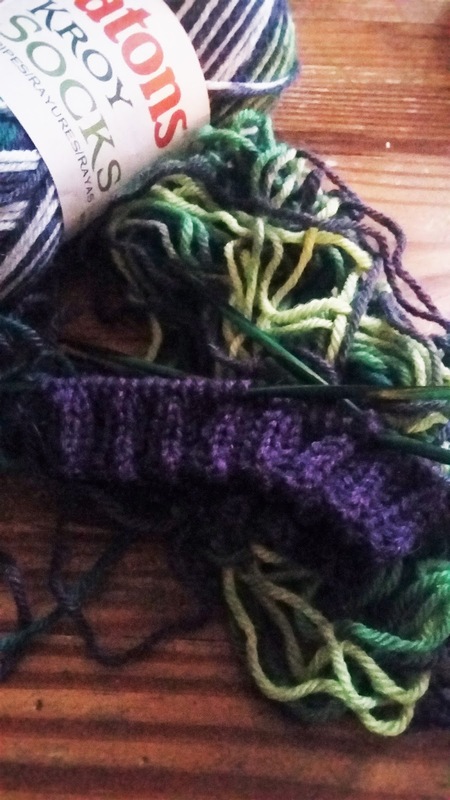 And today, I started a pair of socks. These are the Slytherin vs The Hulk socks mentioned in that same post last week. You can see from the yarn's evil behavior that I'm knitting the Slytherin sock first. 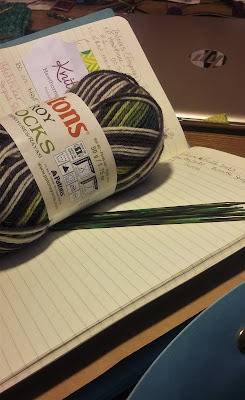 As I mentioned the other day, the yarn is Patons Kroy Socks in the Bramble Stripes colorway. Sarah picked it out. The store only had two skeins left and of course, the dye lots didn't match. One skein appeared to be green and gray with a little brown thrown in. Sarah liked it because it was Slytherin colors. The other skein appears to be mostly purple and greens, thus, The Hulk. I can't wait to see how differently they knit up. It may be that the main difference is that they were wound in opposite directions because as you can see, Slytherin had quite a bit of purple hidden in the center. We'll just have to wait and see how they turn out. And while I knit the socks, I guess it's only natural that I binge watch the Harry Potter and Marvel movies. Join me over at Frontier Dreams for the #CraftingOn link-up. Have you checked the yarn site for photos of the color range? Maybe it is wound in reverse. Movies and knitting just go together so well! I don't usually force it, but I love it when my knitting, reading and/or binge watching have a theme.